Since the bottom of the job market in February 2010, health care alone has accounted for 17% of the 4 million jobs added back into the U.S. economy. Don't just call it a low-wage recovery. It's true that the economy has added a lot of low-paying jobs over the last two years. Restaurants and bars, which pay a median wage of just $9 an hour, have accounted for 15% of all the jobs created in the recovery. Retailers, which pay a median $11 an hour, make up another 9%. But it's not as if fast food joints and shopping centers are the only places adding jobs. Plenty of well-paying industries are hiring too. Factories that make aircraft, cars and machinery have made up a good chunk of the job gains over the last two years, as have hospitals and doctors' offices. So too have professional fields -- particularly those that specialize in computer services or technology. And wages in these industries are hardly low. All of them typically pay well above the median hourly wage of $16.57 an hour. While wages in the field vary, many health care positions pay high wages. People working in ambulatory care -- such as medical and dental offices -- earn a median wage of $18 an hour, according to the Bureau of Labor Statistics. For those working at hospitals, it's $23 an hour. Registered nurses earn around $32 an hour. Another hot sector for job growth has been professional and technical services, a broad category that includes accountants, lawyers, architects and computer engineers. This industry, which boasts a median wage of $28 an hour, has accounted for 13% of all U.S. jobs added since the recovery began in early 2010. Software developers are especially high in demand. 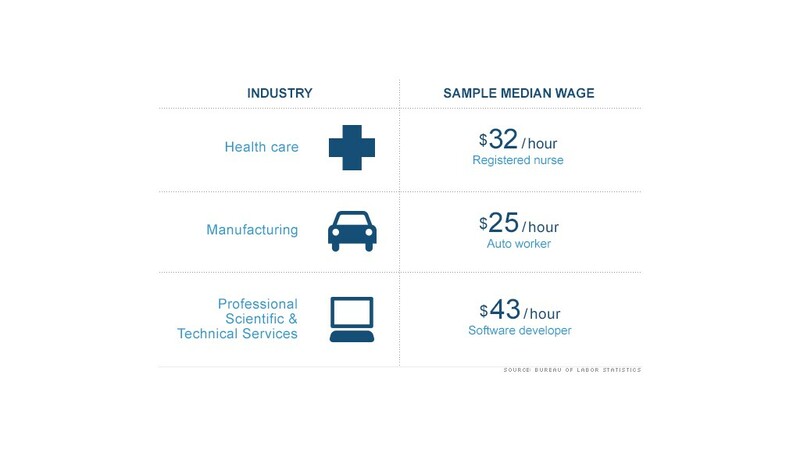 The job pays a median $43 an hour, and that's likely to rise further as employers say they can't find enough workers with the right science, math and business skills to fill these tech jobs. "Even though we know that the unemployment situation has obviously been pretty grim and difficult, in the technology sector the unemployment rate is much lower," said Shami Khorana, president of HCL Technologies' America division. 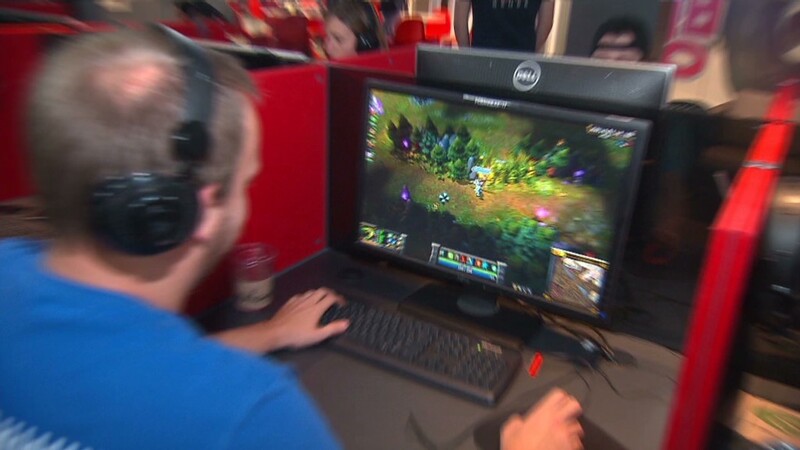 The global IT and software company hired about 2,000 people in the U.S. last year and is planning to hire another 10,000 employees in both the U.S. and Europe by 2015. Khorana said he's looking for employees ranging from business analysts and software programmers, to senior-level managers. Many of these positions offer six-figure salaries to candidates who bring the right mix of experience and education. "It is quite difficult and requires a lot of energy to find the right folks," he said. "The skill sets are somewhat scarce." So what about blue collar jobs? While surely there are fewer, high-paying opportunities for the 4.4 million unemployed Americans who do not have a college education, some manufacturing jobs have started to come back. These jobs often require advanced technical training, but not necessarily a four-year degree. "When you look since the end of the recession, we've had almost 500,000 jobs created in manufacturing, and almost all of those jobs have come from the durable goods sector -- primarily aerospace, motor vehicles, metals, computers, and machinery," said Chad Moutray, chief economist for the National Association of Manufacturers. "Those are high-wage jobs." Durable goods manufacturing jobs have accounted for 11% of the jobs gained in the recovery. The median wage for assembly workers at auto factories, for example, is $25 an hour.